As the Russian Premier League season begins, fans wonder: Can the army take down the Hulk? Play starts Saturday in Russia’s highest level of football. Columnist James Ellingworth previews the season. It’s one of the best-known images in comic book history - The Incredible Hulk versus the might of the army, grabbing a tank by the gun and twirling it around his green head. It also happens to be a good guide to the upcoming Russian Premier League soccer season. On the one hand, you have Hulk. He’s not an angry Bruce Banner but an incredibly muscular Brazilian striker for Zenit St. Petersburg and the highest-earning player in the league by far. To his fans, of which he has many in Russia, Hulk is among the world’s best players and a natural leader. 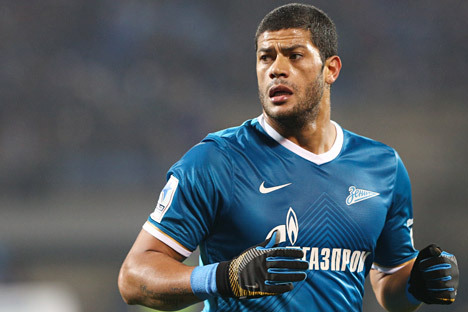 To his detractors, Hulk’s ego is tearing the Zenit team apart. Facing him is the might of CSKA, the Moscow club whose Soviet-era initials still stand for Central Sports Club of the Army (the Russian army is still a minority shareholder). CSKA, playing an at times wildly creative team game, retained the title last season, relegating Hulk and Zenit into second place. The new season starts Aug.1 and CSKA and Zenit start their campaigns the next day, both against small teams newly promoted into the Premier League. CSKA’s management has done well to keep together the team that won the title in the last two seasons, featuring the twin creative sparks of Alan Dzagoev and Zoran Tosic in midfield. However, coach Leonid Slutsky could face a tricky task rebuilding the confidence of his star goalkeeper Igor Akinfeev, who made some high-profile blunders in the Russian net at the World Cup. Hulk is sticking around for a third season at Zenit, something that would have come as a surprise in December 2012, when he pleaded for a transfer out of St. Petersburg, saying he felt “disrespected” by teammates. His involvement in Brazil’s fiasco of a World Cup campaign this summer leaves him with something to prove. When he’s on form, Hulk can surge onto passes and fire shots of unbelievable power, but in the Russian sports media there’s increasing attention on his influence behind the scenes. In the two years since the Brazilian signed with Zenit, two long-serving Russian midfielders have left the club in acrimonious circumstances. First there was Igor Denisov, who was sold to Dynamo Moscow after asking Zenit management for a new contract comparable to Hulk’s salary, something the Brazilian said was a sign of disrespect. Then last season, midfield general Roman Shirokov was sent away mid-season after a feud with management. Without those two, Zenit was lackluster in midfield, meaning Hulk often found himself stranded (it’s not easy being green). That was a key factor in Zenit slipping in the title race last season, something that allowed CSKA to seal the championship with a remarkable comeback, winning 10 games straight. Oddly, Zenit hasn’t strengthened its midfield yet in the transfer window, instead buying Argentinian defender Ezequiel Garay. That means Belgian star midfielder Axel Witsel will have a lot of work to do without reliable support. So far, the signs aren’t promising - Zenit just lost 1-0 to tiny AEL Limassol of Cyprus in Champions League qualifying. Where do other major clubs stand as the season begins? The most successful team in Russian Premier League history with nine titles, Spartak Moscow endured a terrible time last season, winning just three of its last 11 games and finishing sixth. This season, with a new coach and a new stadium - a future World Cup 2018 arena, no less - as well as Zenit refugee Roman Shirokov directing the midfield, some form of title challenge is possible, but beating CSKA and Zenit will be tricky. An outsider for the title is Lokomotiv Moscow, which was surprisingly top of the league for much of last season but faltered late on. Repeating that feat will be all but impossible now - star midfielders Mbark Boussoufa and Lassana Diarra seem set to leave and have not reported for pre-season training. Dynamo Moscow, the new home of former Zenit player Denisov, has been spending big in pursuit of a first Russian (rather than Soviet) title, but so far with little success. Dynamo is in talks to sign French midfielder Mathieu Valbuena. If he arrives, that could signal a title challenge, but otherwise a repeat of last season’s fourth-place finish looks likely. Away from the glamour of the title-chasers, the only other former champion in the league, Rubin Kazan, looks to be in deep decline and mid-table is the best they can hope for. For the first time, there are also four newly promoted teams, ranging from former Soviet champion Torpedo Moscow, back in the Premier League after seven years, to the little-known Mordovia Saransk, FC Ufa and Arsenal Tula, provincial teams hunting for some rare glory. The season runs through May 2015 over 30 rounds of games, almost all played on the weekend. The Russian winter enforces a three-month mid-season break, but even so some games are played in freezing temperatures, indoors or moved hundreds of miles, so being a Russian Premier League fan is not for the faint-hearted.